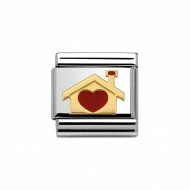 Composable Nomination A Loving Home Red Enamel 18ct Gold Charm, a stainless steel base link with 18ct Gold and Enamel. 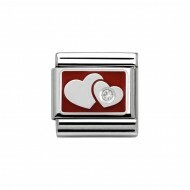 Composable Nomination Bitten Love Heart Red Enamel 18ct Gold Charm, a stainless steel base link with 18ct Gold and Enamel. Composable Nomination Classic Cupids Bow and Arrow Oxidised Silver Charm, a stainless steel base link with Silver and Enamel. 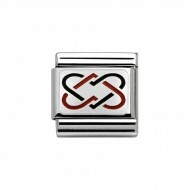 Composable Nomination Classic Cupids Bow and Arrow Red Enamel Silver Charm, a stainless steel base link with Silver and Enamel. 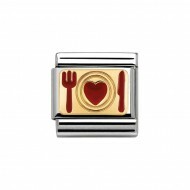 Composable Nomination Classic Food Desire of Love Red Enamel 18ct Gold Charm, a stainless steel base link with 18ct Gold and Enamel. 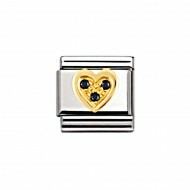 Composable Nomination Classic Gold and Cubic Zirconia Love Black Heart Charm, a stainless steel base link with 18ct Gold and Enamel. Composable Nomination Classic Gold and Cubic Zirconia Love Light Blue Heart Charm, a stainless steel base link with 18ct Gold and Enamel. Composable Nomination Classic Gold and Cubic Zirconia Love Light Blue Heart with Arrow Charm, a stainless steel base link with 18ct Gold and Enamel. Composable Nomination Classic Gold and Cubic Zirconia Love Lilac Heart Charm, a stainless steel base link with 18ct Gold and Enamel. Composable Nomination Classic Gold and Cubic Zirconia Love Pink Heart Charm, a stainless steel base link with 18ct Gold and Enamel. Composable Nomination Classic Gold and Cubic Zirconia Love Pink Heart with Arrow Charm, a stainless steel base link with 18ct Gold and Enamel. 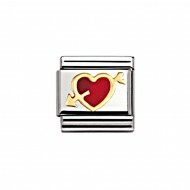 Composable Nomination Classic Gold and Cubic Zirconia Love Red Heart Charm, a stainless steel base link with 18ct Gold and Enamel. 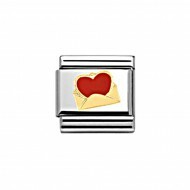 Composable Nomination Classic Gold and Cubic Zirconia Love Red Heart with Arrow Charm, a stainless steel base link with 18ct Gold and Enamel. 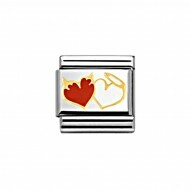 Composable Nomination Classic Gold and Cubic Zirconia Love Red Heart with White CZ Charm, a stainless steel base link with 18ct Gold and Enamel. Composable Nomination Classic Gold and Cubic Zirconia Love White Heart Charm, a stainless steel base link with 18ct Gold and Enamel. Composable Nomination Classic Gold and Cubic Zirconia Love White Heart with Arrow Charm, a stainless steel base link with 18ct Gold and Enamel. Composable Nomination Classic Gold and Enamel Love Abstract Heart Charm, a stainless steel base link with 18ct Gold and Enamel. Composable Nomination Classic Gold and Enamel Love Angel and Devil Hearts Charm, a stainless steel base link with 18ct Gold and Enamel. Composable Nomination Classic Gold and Enamel Love Angel with Heart Charm, a stainless steel base link with 18ct Gold and Enamel. Composable Nomination Classic Gold and Enamel Love Black Double Heart Charm, a stainless steel base link with 18ct Gold and Enamel. Composable Nomination Classic Gold and Enamel Love Black Heart Charm, a stainless steel base link with 18ct Gold and Enamel. 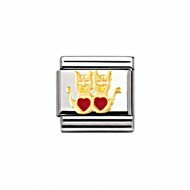 Composable Nomination Classic Gold and Enamel Love Cats with Heart Charm, a stainless steel base link with 18ct Gold and Enamel. 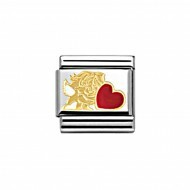 Composable Nomination Classic Gold and Enamel Love Cupid Charm, a stainless steel base link with 18ct Gold and Enamel. Composable Nomination Classic Gold and Enamel Love Cupid with Heart Charm, a stainless steel base link with 18ct Gold and Enamel. Composable Nomination Classic Gold and Enamel Love Double Hearts with Arrow Charm, a stainless steel base link with 18ct Gold and Enamel. Composable Nomination Classic Gold and Enamel Love Double Pink Heart Charm, a stainless steel base link with 18ct Gold and Enamel. Composable Nomination Classic Gold and Enamel Love Flying Heart Charm, a stainless steel base link with 18ct Gold and Enamel. Composable Nomination Classic Gold and Enamel Love Fuchsia Heart Charm, a stainless steel base link with 18ct Gold and Enamel. Composable Nomination Classic Gold and Enamel Love Fuchsia Heart with Arrow Charm, a stainless steel base link with 18ct Gold and Enamel. 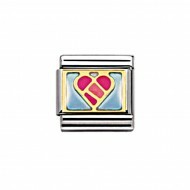 Composable Nomination Classic Gold and Enamel Love Geometric Heart Charm, a stainless steel base link with 18ct Gold and Enamel. Composable Nomination Classic Gold and Enamel Love Heart Envelope with Charm, a stainless steel base link with 18ct Gold and Enamel. 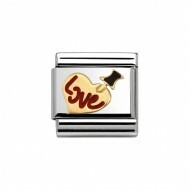 Composable Nomination Classic Gold and Enamel Love Heart with Key Charm, a stainless steel base link with 18ct Gold and Enamel. 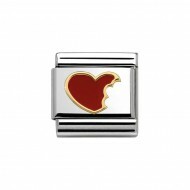 Composable Nomination Classic Gold and Enamel Love Heart with Red Background Charm, a stainless steel base link with 18ct Gold and Enamel. 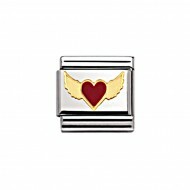 Composable Nomination Classic Gold and Enamel Love Heart with Wings Charm, a stainless steel base link with 18ct Gold and Enamel. Composable Nomination Classic Gold and Enamel Love Light Blue and Blue Heart Charm, a stainless steel base link with 18ct Gold and Enamel. 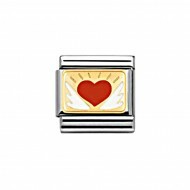 Composable Nomination Classic Gold and Enamel Love Light Blue Glitter Heart Charm, a stainless steel base link with 18ct Gold and Enamel. Composable Nomination Classic Gold and Enamel Love Light Blue Heart Charm, a stainless steel base link with 18ct Gold and Enamel. Composable Nomination Classic Gold and Enamel Love Pink Glitter Heart Charm, a stainless steel base link with 18ct Gold and Enamel. Composable Nomination Classic Gold and Enamel Love Pink Heart Charm, a stainless steel base link with 18ct Gold and Enamel. Composable Nomination Classic Gold and Enamel Love Pink Heart Sweet 16 Charm, a stainless steel base link with 18ct Gold and Enamel. Composable Nomination Classic Gold and Enamel Love Pink Heart with Arrow Charm, a stainless steel base link with 18ct Gold and Enamel. Composable Nomination Classic Gold and Enamel Love Pink Heart with Dots Charm, a stainless steel base link with 18ct Gold and Enamel. Composable Nomination Classic Gold and Enamel Love Red and Gold Hearts Charm, a stainless steel base link with 18ct Gold and Enamel. 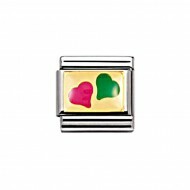 ComposableNomination Classic Gold and Enamel Love Red and Green Heart Charm, a stainless steel base link with 18ct Gold and Enamel. Composable Nomination Classic Gold and Enamel Love Red and Green Hearts Charm, a stainless steel base link with 18ct Gold and Enamel. Composable Nomination Classic Gold and Enamel Love Red and Pink Heart Charm, a stainless steel base link with 18ct Gold and Enamel. 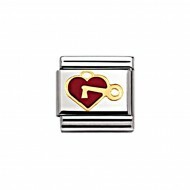 ComposableNomination Classic Gold and Enamel Love Red Double Heart Charm, a stainless steel base link with 18ct Gold and Enamel. Composable Nomination Classic Gold and Enamel Love Red Heart Charm, a stainless steel base link with 18ct Gold and Enamel. Composable Nomination Classic Gold and Enamel Love Red Heart with Arrow Charm, a stainless steel base link with 18ct Gold and Enamel. 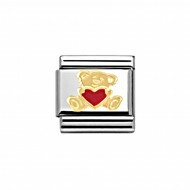 ComposableNomination Classic Gold and Enamel Love Teddy with Heart Charm, a stainless steel base link with 18ct Gold and Enamel. 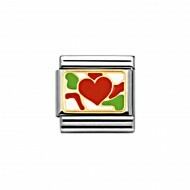 Composable Nomination Classic Gold and Enamel Love Ti Amo Heart Charm, a stainless steel base link with 18ct Gold and Enamel. Composable Nomination Classic Gold and Enamel Love Violet Heart Charm, a stainless steel base link with 18ct Gold and Enamel. Composable Nomination Classic Gold and Enamel Love White Double Heart Charm, a stainless steel base link with 18ct Gold and Enamel. ComposableNomination Classic Gold and Enamel Love White Heart Charm, a stainless steel base link with 18ct Gold and Enamel. Composable Nomination Classic Gold and Enamel Pois Polka Dot Heart 18ct Gold. 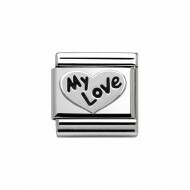 Composable Nomination Classic Gold Love Be Mine Charm, a stainless steel base link with 18ct Gold. Composable Nomination Classic Gold Love Cupid Charm, a stainless steel base link with 18ct Gold. Composable Nomination Classic Gold Love Double Heart Charm, a stainless steel base link with 18ct Gold. 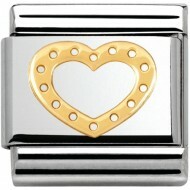 Composable Nomination Classic Gold Love Heart Charm, a stainless steel base link with 18ct Gold. 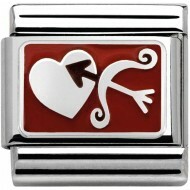 Composable Nomination Classic Gold Love Heart with Arrow Charm, a stainless steel base link with 18ct Gold. Composable Nomination Classic Gold Love Raised Heart Charm, a stainless steel base link with 18ct Gold. Composable Nomination Classic Interlocking Hearts Black and Red Enamel Silver Charm, a stainless steel base link with Silver and Enamel. Composable Nomination Classic Love Heart Pink CZ Oxidised Silver Charm, a stainless steel base link with Silver and Enamel. Composable Nomination Classic Love Heart White CZ Oxidised Silver Charm, a stainless steel base link with Silver and Enamel. 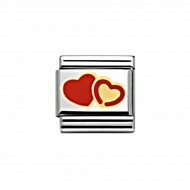 Composable Nomination Classic Love Hearts Red Enamel and CZ Silver Charm, a stainless steel base link with Silver and Enamel. 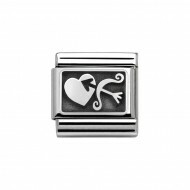 Composable Nomination Classic My Love Heart To You Black Enamel Silver Charm, a stainless steel base link with Silver and Enamel. 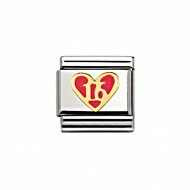 Composable Nomination Classic Pinned Heart Red and Black Enamel 18ct Gold Charm, a stainless steel base link with 18ct Gold and Enamel. 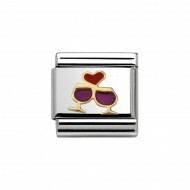 Composable Nomination Classic Romantic Wine Purple and Red Enamel 18ct Gold Charm, a stainless steel base link with 18ct gold and Enamel. Composable Nomination Classic Wedding Rings Silver Charm, a stainless steel base link with Silver and Enamel.